If you’ve been reading The Ten Minute Missive for very long, then you know we lost our dog on June 1. And, of course, I’m using the euphemism “lost” because even though I don’t like using euphemisms for death, when death is part of life for real and not in a theoretical fashion, I find myself pausing over saying the word. It’s as if his death is a speed bump that yes I can get over, but it slows me down at the oddest moments. I miss his eyes. How his eyebrows raised when he was wondering why on earth I wasn’t taking him for a walk. Again. And I miss how “old soul” his eyes were. I was telling a friend (and forgive me if I’ve written this already – no way I’m going back and reading those earlier posts) about how my dog was a part of all the big moments of my life for the past nearly 10 years. When I went into labor with Littlest, Charlie’s eyes checked on me. When Biggest walked to kindergarten, Charlie made sure I was okay with it. When I got the news that Buddhapuss Ink had selected me for their first place short story, it was Charlie’s eyes that looked at me – right before I started crying. Anyway, I miss his eyes. It’s funny how much things can change in a very short time. One the morning of June 1st, we woke up to gray skies. It had rained and thundered the night before and everything was still very wet in the morning. It looked a bit like today’s cloudy morning, although we didn’t get rain last night. 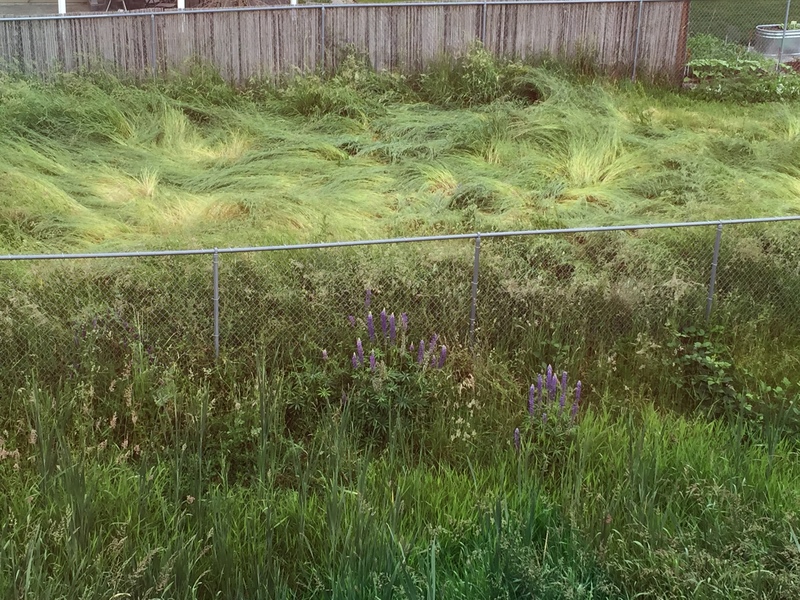 When I opened my blinds that morning, the grass behind our house lay all topsy-turvy; its chaos providing a visual for how hard the night before had been. Heavy rain, heavy wind. And inside our house, heavy hearts. What had been four foot tall wild grasses lay flattened as if some giant foot had stepped there without regard. When I took the photo, I was primarily interested in capturing the contrasting colors of the grass. Because it was bent over, different parts of the grass were visible that hadn’t been before. I appreciated those new shades of green. And because I paused, I also noticed the lovely purple flowers in the foreground. It’s been 18 mornings without Charlie jangling his id tags to tell me that it’s time to wake up. Those passing days have helped but I still miss him. This morning when I opened the blinds and noticed how gray the morning was again, I noticed something else. The grass across the way isn’t “bouncing back” and won’t be. And the purple flowers have lost their blooms. But the reason I stopped and took the picture, and which disappeared when I raised the blinds, was because a cat was perched on the fence intent upon a catching a bird. 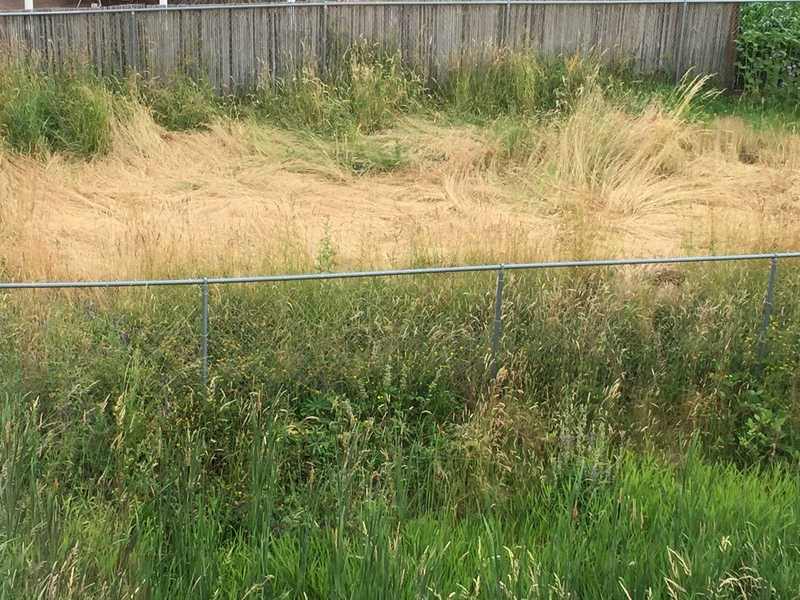 I raised the blinds, the bird flew away, the cat jumped off the fence and slunk away through the tall grasses, and all that was left behind is dead grass, crushed flat by a storm that passed without a care. At least, that’s what I thought at first. But then I got out my binoculars and looked at that wildness more closely. Mixed into all that death and “end-ness” are tiny yellow flowers. Flowers that I certainly wouldn’t have ever seen if the grass were still four feet tall and growing. I’m not even sure if they would have grown if the grass was still there. Living means hurting. As Littlest said when he got the news about Charlie: “That’s just the way things are.” And in the morning after being flattened, there is nothing that can be seen besides the ending. But as time passes, new beginnings show up if we can heal our aching hearts enough to see them. I have several friends and acquaintances dealing with fresh loss right now. Our news is filled with all varieties of families struggling with loss. Each of those hearts are hurting so much and I wish it were possible to ease those pains. But there is no antidote that comes in a sealed envelope or foil covered dish. Only time eases the ache. Charlie taught me that I struggle to say the words “dead” or “died” when it applies to my own life. But he also strengthened my resolve to keep speaking the names of those I miss. To talk about the keepers of my heart as if they still are present because as long as I remember the way they looked at me, they are not gone…they are just around the corner in another room. I still miss Charlie and his old soul eyes. But I am getting ready to go look for another beautiful soul to share this life journey with…and in doing so, not only my own aching heart will heal, but another one will as well. Please consider adopting your next pet from a local shelter. The life you save will end up changing your life as well. This entry was posted in family, Front Page, pet ownership and tagged coping with death, healing, Oregon Humane Society, pet loss, SW Washington Humane Society by kristina. Bookmark the permalink. Yeah, that whole dealing with loss Is a huge and odd thing. Thanks much for sharing how you’re doing with it. As you often do, you’ve worked some acute observations into apt analogies. Hope you find another great dog soon, though of course it won’t be Charlie.